Since the My Places tab was released earlier this summer, you’ve been able to view all the places you’ve rated in one manageable list. This list is now being used to personalize your view of Google Maps, enabling you to visualize all the various places you’ve visited, loved, loathed, and might want to check out right on the map. 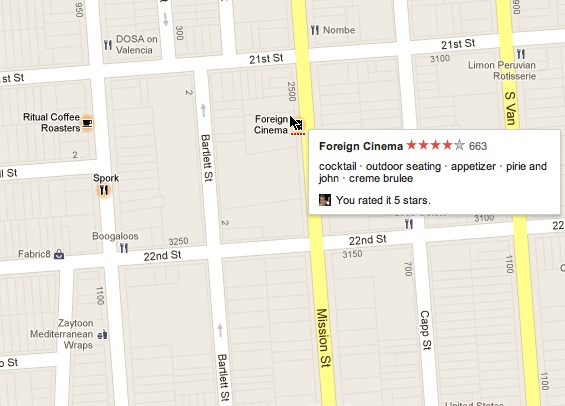 Starting today, business labels for locations you’ve rated with Google Places will be highlighted on the map with your corresponding rating beneath it. Additional places that our system thinks you might enjoy visiting -- either to eat, shop, or more -- will be highlighted as well. 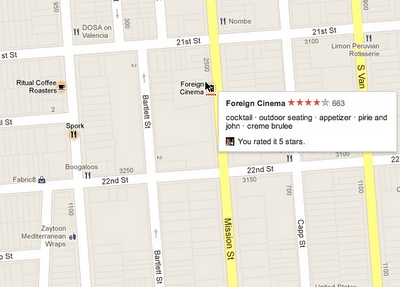 These personalized recommendations are based on the places and ratings you’ve already shared. Whereas old paper road maps only became “personalized” when you accidentally folded them the wrong way, spilled a drink on them while driving or physically got out a highlighter to circle locations of interest, we hope this simple and lightweight way of emphasizing the places you’ve shared your opinions about makes Google Maps even more personal, relevant and helpful. These highlighted map labels are available on the desktop and Google Maps for Android. To get started, sign in with your Google account and either check out a place you’ve rated or contribute more Places ratings.